Day 2 of CHALE WOTE 2017 began on Tuesday afternoon with Open Surgery, a creative fiction writing workshop led by award-winning Ghanaian author, Nii Ayikwei Parkes, for 8 writers selected through an open call. The laid-back event held on the ground floor of Brazil House was less workshop-style and more informal and open with very interactive conversations between writers who were either meeting for the first or the umpteenth time, united by an undying passion for sharing pieces of themselves and their communities through the stories they weave. The selected writers – young, bold and unafraid to put their work up for scrutiny – read excerpts from their submitted pieces and received unbiased, encouraging and invaluable feedback from each other, Parkes and witnesses present. The feedback touched on everything from language, pacing, creating unboxed writing styles, characterization, and setting. The best part, however, was that it was all so organic. One participant, Temitayo Johnson, commented on how this workshop was a much better learning experience than all the creative writing classes she’d had combined. Each writer got a front-row seat into the perspectives and interpretations of their work through fresh eyes that posed delicate questions, offered advice and inspired the writers to be like WATA MATA, constantly flowing and most importantly, enjoying the process of creating and being, echoing Nii Ayikwei Parkes’ counsel that, “if you’re not having fun writing, then stop!”. Some of the stories touched on family, intimacy, identity, and even psychedelic road trips with a host of themes that explored what it means to be human. U.S. based researcher and artist April Bey then stirred up WATA MATA at the National Theatre (Folkspace) with her talk, “Dolezalism and Jollof Rice from 6-8pm. Originally from the Bahamas, Bey’s lecture systematically unveiled the whole trans-racial saga that broke out in 2015 with controversial figure Rachel Dolezal. She began by going through Dolezal’s background as a fine artist and her fixation on painting the bodies of young black boys and how this may be an indicator of the state of Dolezal’s mental health. Bey also touched on the mainstream media’s portrayal of the whole affair, especially the difference in interpretation around Blackness and cultural appropriation between media and inter-African communities. For April, it is important to push beyond binaries and understand the background behind Dolezal’s evolution before one can grasp her motives and understand why her identification as “trans-black” is problematic. As an artist herself, April Bey’s personal body of work, including a new analogue printing technique that producers laser print quality and was developed whilst in Ghana last year on residency, will debut at the festival and interrogate the aesthetic qualities attached to race. She also debuted the cover of Jollof Magazine, a fictitious magazine she created, with Rachel Dolezal on the cover of the first edition as well as some of her work installed in the Bahamas which are centred on the nuanced portrayals of Blackness in art. Our understandings of race and culture and even appropriation are at least partly determined by our geographical contexts and social environments. April Bey’s focus as an artist and researcher during her lecture went beyond trying to find out if Rachel Dolezal, sorry, Nkechi Amare Diallo (Dolezal’s new legal name) would like Jollof Rice to debunk the myth of trans-racialism. However, she explicitly explained why race structures cannot be binary and in fact extends beyond two simple choices like right and wrong to a much more elaborate and delicate network of personality traits, shared memories and experiences collectively making up a person’s race. Day 3 of CHALE WOTE 2017 (Wednesday, August 16) includes more open Gallery events. “DISPERSED” featuring the work of 3 UK female artists from the Black British Female Artist(BBFA) Collective and 3 Ghanaian female artists opens today at the Nubuke Foundation (Lome Close, East Legon Accra), 10am – 5pm. Elisabeth Efua Sutherland also outdoor’s ”Deverb” – a sound and video experiment using women’s song traditions of Fanti culture as a sonic base to explore the role and importance of woman as griot in Akan society at Terra Alta (Abelemkpe Junction, next to Lucas College) at 6PM. 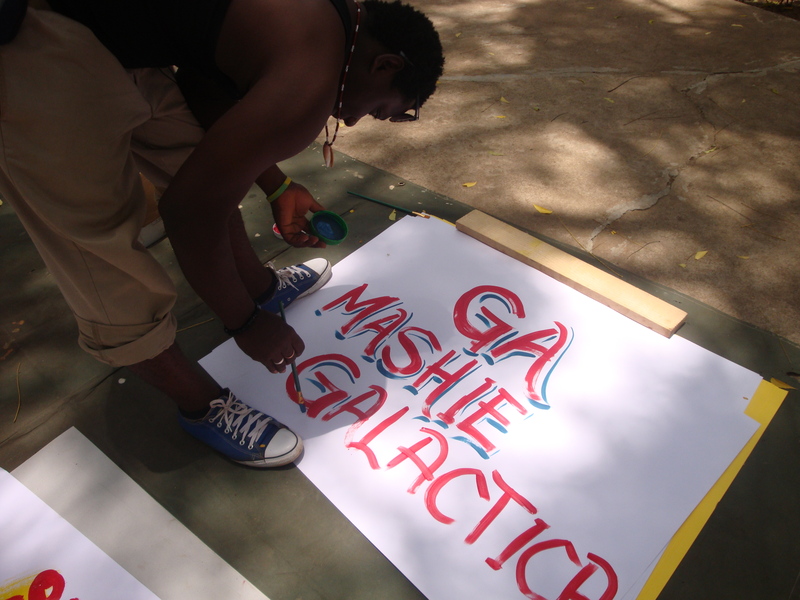 On Saturday, March 31st we hosted a live action art jam at the Foundation for Contemporary Art Ghana (FCA) office….